This is my least favorite book in the series. You get some good information to move things along, and it is exciting, but wow does Rowling use "savage" a lot. That's not why it's my least favorite book though, no. It's my least favorite book because one of my favorite characters dies. Maybe I'm growing disenchanted by the books that I loved so much as a kid. Maybe that's a good thing. In Harry Potter and the Order of the Phoenix, Harry Potter has been having weird dreams about a door at the end of a corridor. He has been waking up and screaming in his dreams. He believes that He-Who-Must-Not-Be-Named is back. The magical government nor the authorities at Hogwarts can stop him. There is a big surprise with the Gyrffindor Quidditch team and to add extra pressure on Harry he has the O.W.L. exams. Will he be able to find out what is at the end of the corridor? I like this book because it is action packed and funny. I recommend this book to people who like action and mysteries. Yep, I love Harry Potter! One of the few books (well, the whole series) that I reread! The books just keep getting better and better. One thing I have enjoyed reading is about Snapes character and the reasons why he hates Potter so much. Seeing these glimpses is just one of many interwoven stories. 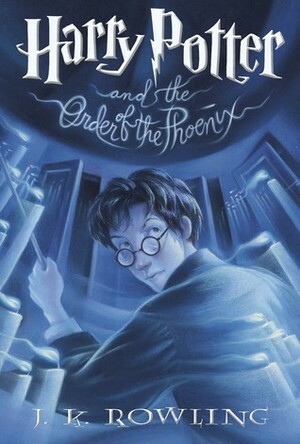 Harry Potter and the Order of the Phoenix is the angry book۝ of the series. It is a significant change from the action-packed but still essentially light-hearted Goblet of Fire, and it is the volume that showed us that Rowling meant business. Fifteen is an angry, conflicted age, when we become caught between childhood and growing up, and Rowling captures the dynamics of it beautifully. Harry has, thus far, been a relatively average boy with not-so-average problems, and he has dealt with them without much analysis and a surprising lack of woe-is-me angst. Not so in Phoenix; Harry has acquired the self-reflective tendencies typical of teenagers, with the added burden of a genuinely terrible, life-threatening problem. That۪s not to say he doesn۪t also suffer from the ordinary issues of adolescence- the everyday struggles of bullies, schoolwork and girls are added to (and complicated by) his already heavy load. Harry is coming along quite nicely as the representative of the typical teenager. Sullen, angry, rebellious and downright self-absorbed at times, he rides a roller coaster of highs and lows all throughout his fifth year at Hogwarts. It also doesn't help that Harry has more than one kind of inner demon to deal with. And then there۪s Ron and Hermione, faithful as ever, treading around Harry like a freshly-planted minefield and dealing with their own pressures and dilemmas. Ron has, thankfully, gotten over his bout of jealousy and stands steadfastly by Harry, even when it is quite likely that Harry is going to bite his head off in all of his frustration. Hermione really comes into her own as a leader and tactician in Phoenix; it is through her that the students find the means to come together to combat the threat they know is lurking just outside their cloistered school existence; however, the army۝ formed by Hermione-and led by Harry- has repercussions that even Hermione۪s sharp mind fails to foresee until it۪s too late. Voldemort is a very real threat, but anyone who has read this (and who hasn۪t at this point?) knows that the star of the evil show is Dolores Umbridge, one of the vilest baddies I۪ve seen in YA fiction. Not only is she repulsive physically, but her evil is of a complicated (though still fairly obvious) sort. The Dark Lord and his Death Eaters are straightforward villains; they plot and kill without remorse and make no qualms about it. Umbridge, on the other hand, is technically on the side of good, in so much as she stands neither with nor against You Know Who, since she refuses to acknowledge his existence (though there are further issues as to whether the Ministry۪s placement of Umbridge at Hogwarts hints at a desperate desire to cover up the truth). The timing of Umbridge۪s introduction into the series is brilliant. Authority can rarely retain an unquestioned hold over the adolescent mind, so Harry, Ron and Hermione must question the powers that have hitherto gone unexamined, and Harry has the advantage of being in the right as he stands against Umbridge and the corrupt Ministry she represents. She is bigoted, passive-aggressive and cruel, forcing the students to undergo abusive punishments within the very walls of Hogwarts, the domain of the benevolent and generally sharp-sighted Dumbledore. If Phoenix is our first glimpse into a complicated and morally questionable element in the previously benign magical world, is also our first introduction to the fallibility of the great Albus Dumbledore and, in a broader sense, adults in general. (I would love to go on to an examination of the Heroic, Joseph Campbell elements in this struggle, but this is a review, not a term paper and it۪s shaping up to be long-winded as it is). Dumbledore has always been Harry۪s safety net, his link to knowledge and reassurance, but his early failures to fulfill this role in the opening chapters of the book provokes the already rebellious Harry into a complete rejection of the benevolence and wisdom of Dumbledore. Harry refuses, point-blank, to turn to Dumbledore, feeling (fairly) that Dumbledore has much to deal with already and (perhaps unfairly) that he doesn۪t care about Harry as anything more than the symbolic Boy Who Lived. This new fallibility sets up books 6 and 7 quite nicely, but I won۪t get into that here. Dumbledore hovers around the edges of the narrative, much like Voldemort; seemingly invisible as Rowling delves into the heart of her boy hero rather than the struggle going on all around him. As a book about adolescence, Phoenix gives us a plethora of troubling adults. The Ministry of Magic, the ultimate representation of authority in the magical world, is proven to be unreliable, if not completely corrupt. Dumbledore is essentially absent, Umbridge is downright evil and the other teachers are torn between the responsibility of their posts and their obligations to the larger struggle. Snape is particularly horrible to Harry in this volume, and I can۪t help but hate him, even re-reading this after knowing how his story unfolds in the 6th and 7th volumes. Mrs. Weasley, as a harried mother of seven children, is a nervous wreck and while she provides support, she also refuses to see Harry and her sons and daughter as more than children to be sheltered. And then there۪s Sirius, the most fallible and yet most understandable of the adults around Harry. Sirius is much like a stunted- adolescent himself; he has essentially grown up from young adulthood to middle age in captivity, unable to develop properly. In his earlier interactions with Harry, he has played the concerned guardian, but the pressure of captivity, not helped by the antagonism of Snape, has seemingly caused a sort of reversion to adolescence. He is reckless and impetuous, forcing Harry into a role reversal where he must act the responsible adult, just as he is realizing that the adults around him are not the bastions of safety and reliability he once believed them to be. The earlier books may have been formulaic and generally cheerful overall, but Goblet of Fire gave us brief glimpses of the larger themes that have come to the foreground in Phoenix; the Moody/Barty Crouch fiasco revealing the fallible nature of adults, and the tragic death of Cedric Diggory acting as the catalyst to even greater sadness and loss in the future. In many ways, the real tragedy of Harry Potter and the Order of the Phoenix is the loss of innocence and the corruption of trust that this loss embodies. Overall, Order of the Phoenix is a beautiful and complicated book. The prose may be simple, but the themes are not, and Rowling carries us into the very darkest core of the beloved Harry Potter universe and manages to bring us out on the other side, with our faith in its goodness and continuing survival intact. I really liked this book, even though the ending is heart-breakingly sad. This is the book where the fighting really starts and the war really begins. Bad things happen in war and this book doesn't shy away from them.